Read here about Richard Buckminster Fuller (1895-1983), who coined the word 'tensegrity' and was a key figure in its development and promotion. The article relates Fuller's biography, how tensegrity fit into his broader geometrical explorations, and includes photos of many his tensegrity deployments. 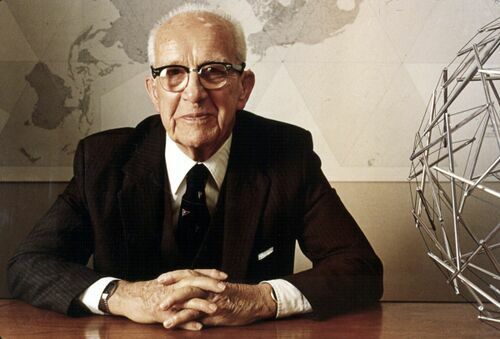 Richard Buckminster Fuller (1895-1983) was renowned for his comprehensive perspective on the world's problems. For more than five decades, he developed pioneering solutions that reflected his commitment to the potential of innovative design to create technology that does "more with less" and thereby improves human lives. Fuller inspired Snelson to discover tensegrity, worked to perfect its basic forms, and promoted it as a universal model of structure. Fuller maintained that tensegrity was an integral and logical part of his energetic-synergetic geometry, a holistic worldview of thermodynamics that explores geometrical and structural forms in the context of human life. He coined the term "tensegrity," innovated many tensegrity concepts, and was a tireless promoter of its study, research and application. Fuller's methodology which he named "comprehensive anticipatory design science" is thought by many to still be an effective way of continuing tensegrity research and extending it into new domains. 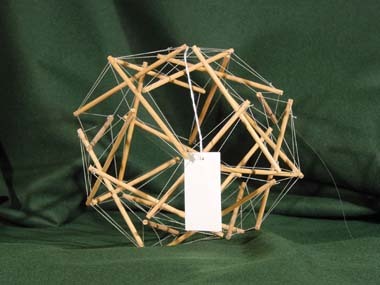 A selection of images featuring Fuller and tensegrity constructions with which he was associated. Images of models are found below. 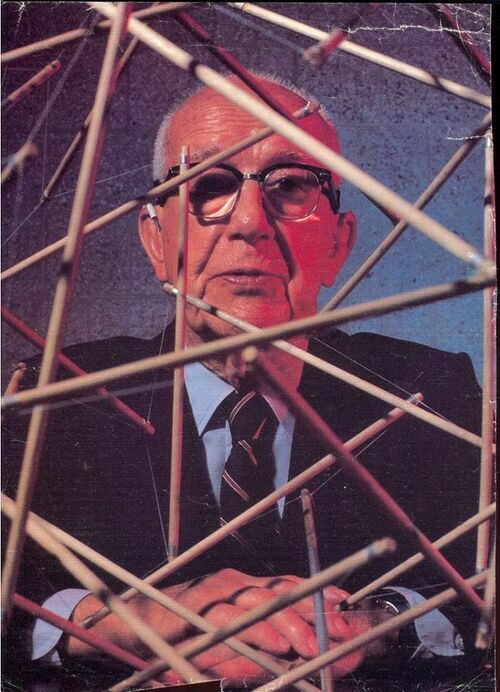 Fuller seated next to tensegrity sphere. 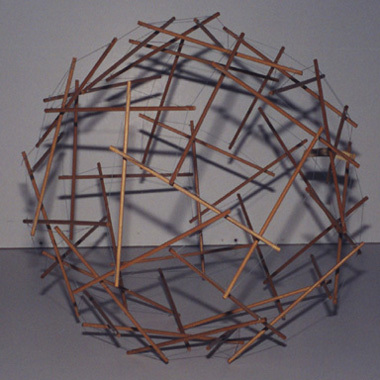 Fuller behind a tensegrity sphere. 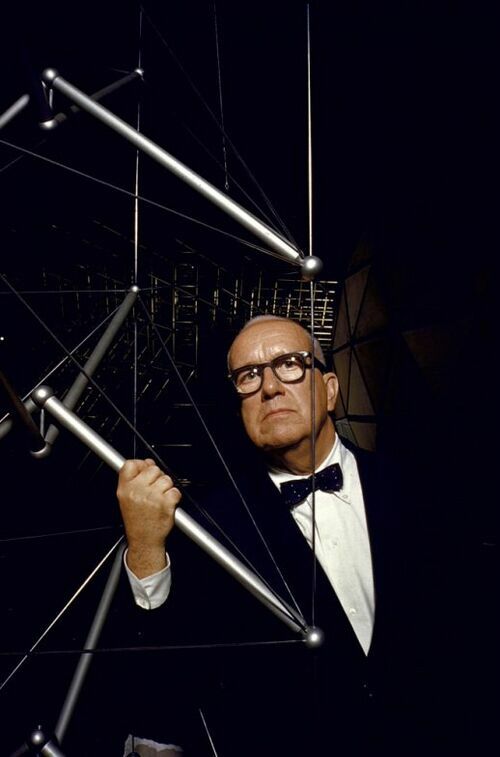 Fuller holding a strut of the 1959 MOMA Tensegrity mast. Born in Milton, Massachusetts, on July 12, 1895, Richard Buckminster Fuller belonged to a family listed in the American social register and noted for producing strong individualists inclined toward public service and activism. "Bucky," as he came to be called, had a brother and two sisters. He studied in a Frobel Kindergarten where, manipulating peas and toothpicks, he constructed triangulated structures. He was acutely farsighted in his youth, a condition only diagnosed and corrected when he was four years old. During family excursions to Bear Island, Maine, he developed his early appreciation of nature on both land and sea, and became familiar with the principles of boat maintenance and construction. His father died on his tenth birthday, and his mother and her extended family became his primary caretakers. Fuller followed family tradition and entered Harvard University in 1913, but was expelled after excessively socializing and missing midterm exams. Fuller returned to Harvard in the autumn of 1915 but was again dismissed. He would not receive his degree, but later in life returned to teach at the university. Following his first expulsion from Harvard, Fuller apprenticed in Canada as a cotton mill machine fitter, where he took a strong interest in machinery and learned to modify and improve the manufacturing equipment. After his second 1915 expulsion from Harvard, he worked at Armour & Co, New York City, where he was promoted from meat lugger to a manager of national and international accounts. From 1917 until 1919, Fuller served in the U.S. Navy, and was nominated to receive officer training at the U.S. Naval Academy. In 1917 the United States of America declared war on the German Empire. He requisitioned his mother's boat in order to patrol the Maine coastline. Such were patrols were soon ended: Germany's navy did not reach North America in World War I though it did so in World War II, not far from Maine. Fuller married Anne Hewlett on his twenty-second birthday in 1917 and their first daughter, Alexandra Willets, was born to them a year and a half later. She was to fall tragically become ill with spinal meningitis, pneumonia, pyrosis, pysoloszis and died just shy of her fourth birthday on Nov 14, 1922. This emotional blow had many personal, marital, financial and career ramifications for Fuller. Soon after her death his father-in-law, James Monroe Hewlett, developed a new method of producing reinforced concrete buildings. He proposed that he and Fuller market it together, and the Stockade Building System company was formed. He patented several aspects of the invention, some with Fuller as co-inventor, some with Fuller as sole inventor, earning Fuller the first of his 25 patents. Five years on, the company had built hundreds of building and Hewlett was ready to divest somewhat. In parallel, Fuller continued to develop his own ideas, and he may have entered into a conflict of interest with the parent company. By 1927 as the Stockade company reorganized, Fuller underwent a crisis of personal identity. He ceased working for other companies and set out to found his own company and follow his own research agenda. See below for more details about this crisis. He envisioned an air-delivered, modular apartment building, he designed the Dymaxion House, an inexpensive, mass-produced home that could be airlifted to its location. Originally called the Fuller House, Lightful House or 4D House, it was later renamed by a department store that displayed a model of the house. The word "dymaxion" was coined by store advertisers and trademarked in Fuller's name. Based on the words "dynamic," "maximum," and "ion," it became a part of the name of many of Fuller's subsequent inventions. The word became synonymous with his design philosophy of "doing more with less," a phrase he later coined to reflect his growing recognition of the accelerating global trend toward the development of more efficient technology. In 1946, Fuller received a patent for another breakthrough invention: the Dymaxion Map, which depicted the entire planet on a single flat map without visible distortion of the relative shapes and sizes of the continents. The map, which can be reconfigured to put different regions at the center, was intended to help humanity better address the world's problems by prompting people to think comprehensively about the planet. In the early 1950's he coined the now familiar phrase "spaceship earth" to describe the integral nature of Earth's "living system." Beginning In the late 1960s, Fuller was especially involved in creating World Game, a large-scale simulation and series of workshops he designed that used a large-scale Dymaxion Map to help humanity better understand, benefit from, and more efficiently utilize the world's resources. Throughout his life, Fuller found numerous outlets for his innovative ideas. During the early 1930s he published Shelter magazine, and from 1938 until 1940 he was science and technology consultant for Fortune magazine. During the 1940s he began to teach and lecture at universities, including Harvard and MIT, and in the late 1950s he became a professor at Southern Illinois University (SIU), where he and his wife lived in a geodesic dome when he was in residence. In 1972 he was named World Fellow in Residence to a consortium of universities in Philadelphia, including the University of Pennsylvania. He retained his connection with both SIU and the University of Pennsylvania until his death. He was the author of nearly 30 books, and he spent much of his life traveling the world lecturing and discussing his ideas with thousands of audiences. Some of Fuller's many honors highlight his eclectic reputation: For example, because he sometimes expressed complex ideas in verse to make them more understandable, in 1961 he received a one-year appointment to the prestigious Charles Eliot Norton Professorship of Poetry at Harvard. After being spurned early in his career by the architecture and construction establishments, Fuller was later recognized with many major architectural, scientific, industrial, and design awards, both in the United States and abroad, and he received 47 honorary doctorate degrees. In 1983, shortly before his death, he received the Presidential Medal of Freedom, the nation's highest civilian honor, with a citation acknowledging that his "contributions as a geometrician, educator, and architect-designer are benchmarks of accomplishment in their fields." For detailed timelines of relevant events in Fuller's long career, see Fuller, R. B. Timeline. Mr. Fuller's idol Henry Ford, hero to him and most Americans, was also undergoing a crisis. His Model T had lost market share, ridiculed as passe, while its inventor was paraded in the daily papers as an ignoramus, untrained in history, and on trial for publishing libels in his newspapers. Yet this was the Roaring Twenties. In Chicago, where Fuller lived, a frenzied optimism ruled. Jazz music, prohibition and Flappers' styles set a tone of freedom and individualistic empowerment, proving that old conventions could be discarded. Babe Ruth hit record home runs, airplanes set heroic distance records weekly, movies began talking, and wireless radio and wireless electric power seemed magical. On the tragic side the largest flood in U.S.A. history engulfed the Mississippi basin and anarchists and Al Capone's gang set bombs and murdered dozens. To this drumbeat of crisis, death and rebirth Mr. Fuller underwent his own personal identity crisis and transition. In long walks shaded by the towering Elm trees of Lincoln Park, beside the waters of Lake Michigan, the cold sun shone as Fuller faced his failures. He was depressed, did not see a way out of it, and considered suicide, as countless other businessmen would do two years later after the crash of 1929. The Park itself was awash in legends of suicide, and ghosts from Suicide Bridge were said to wander there at night. But suicide was not to be. Instead, visions of selfless commitment to Truth flooded his thoughts. The change probably took place over a period of months, between November 1927 to February 1928. By its end Mr. Fuller had radically changed his working methods, job focus, and way of speaking. He codified his own theory of spheres, tension and compression. He sought investors for a new lightweight shelter built on these new principles, and had set firmly out on the road that would lead to the discovery of tensegrity two decades years later. At the heart of the transformation was his newborn daughter. He feared her dying a lingering diseased death as her sister had four years before. He measured her footprints, height changes and measured his own as well, in an act of intense identification with the unfolding of naive life. He began to aggressively research and aggregate documents, including reading diaries of his ancestors. He attempted to conceal his financial difficulties from his wife, but finally broke the news before Christmas 1927 that they could no longer live in luxurious surroundings, causing yet another crisis in his marriage. At some point, probably February 1928, he read Margaret Fuller's account of her personal identity crisis. Shocked by the similarity of Ms. Fuller's thoughts about Truth and selflessness to his personal transformation, he adopted her outlook and story to such a degree that it became his own. Her insights mixed with other recent, unconventional ways of looking at reality, such as Claude Bragdon’s (1866-1946) multi-dimensional geometry, and Ouspensky's (1878-1947) theosophical writings. Fuller's personal identity crisis, as interpreted through the words of Margaret Fuller, were critical to his tensegrity research agenda. Fuller's brush with disaster, failure, catastrophe and near-suicide formed a permanent launching pad. Like the starting point for a pole vaulter (an analogy Fuller favored), he began many of his lectures and thinking-out-loud sessions with tales of his 1927 rebirth. Fuller found that a the loss of conventional bearings, the death of habit and family structure, and meditation on the unity of all things (as reflected in the laws of energy conservation) were essential to rethinking structure and the deployment of forces inherent in tensegrity research. They inculcated a perspective on selflessness, a holistic view of humanity as a single body, a commitment to discarding conventional habits and a passion for discovering Truth. The role of the crisis in Fuller's intellectual life is made clearer by comparison with other leading inventors and artists who suffered similar crises. A few examples from early 1900's East Coast America include Thomas Edison, Nikola Tesla, and Mark Twain. Nikola Tesla contracted cholera at age 17 and nearly died. He later wrote in his autobiography that his father pledged, on Nikola's deathbed, that if Nikola lived he could be an engineer rather than a priest. This rejuvenated the dying Tesla, and he went on to a long productive life. These examples are brought as arguments to the contrary. .None of these prolific East Coast Americans, neither Edison, Tesla nor Twain, repeatedly talk and write about their near-suicides and selflessness in the main body of their work. Edison went on to invent the kinetoscope. Tesla only shared his story in a few interviews and in his autobiogrphay, written late in life. Twain's note remained in the margins of the book. When any of these three men lectured or wrote, it was about their innovations and productions, and not their personal crises. Yet Fuller consistently returned to the story, and he was the one who discovered and codified many aspects of tensegrity. Since tensegrity itself is about ephemeralization, light-weighting and the non-conventional structuring of natures forces in radically new ways, perhaps Fuller's method should play an ongoing role in the research of tensegrity. The roots of Fuller's geometry can be found first in the 'peas and toothpicks' manipulative toy he used in the Frobel kindergarten that he attended circa 1900. Its next big step forward was the set of concepts that became clear to him during his personal identity crisis in 1927. These include a "theory of spheres" and maximal reliance on tension and compression as implemented using piano wire and pneumatics. Fuller formulated his ideas in the context of other four dimensional ideas current at the time, particularly the projective ornamentations (with spiritual overtones) of Claude Bragdon and the time-space geometry proposed by Albert Einstein. In addition, the experiments of Cubism often cited the 4th dimension. For more discussion of Fuller's geometry see Synergetics, or read about his book, Fuller's Two Volume Synergetics. Fuller's two volume work Synergetics features a detailed discussion of tensegrity. See Fuller's Two Volume Synergetics. 30 strut icosahedron tensegrity by Fuller. 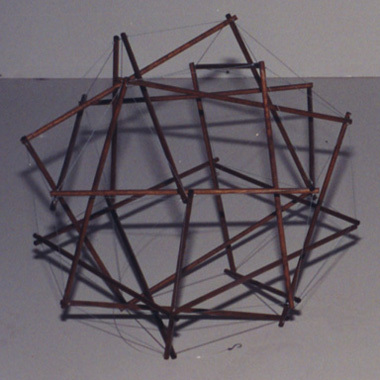 Original Fuller tensegrity in the Stanford archive. 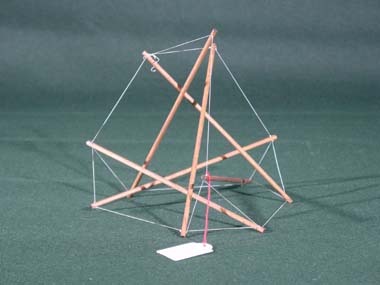 6 strut Fuller tensegrity, in the Stanford archive. This page was last edited on 24 November 2018, at 10:48.